The state known best for sun and fun, beaches and a wide variety of water-related activities, is always hot when it comes to its many musical events. Many festivals featuring live entertainment combine the sounds with the outdoor nature of the Sunshine State. And every year, the lineup of events grows. It all shows that when it comes to music, Florida is hotter than ever. 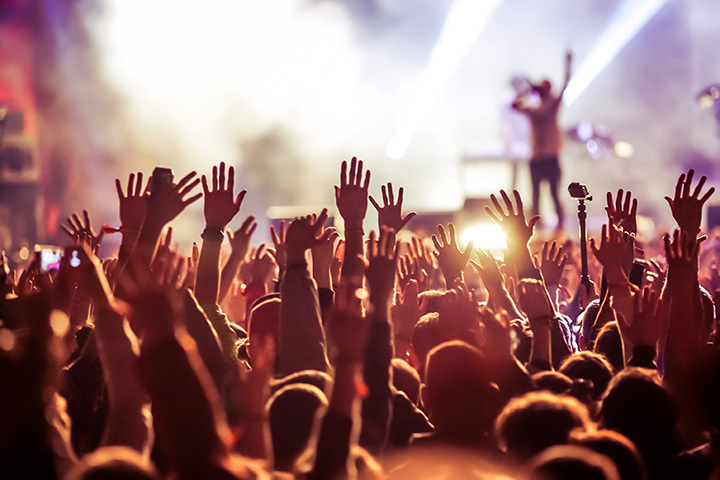 You can find outstanding musical events in big city areas like South Florida and you can find them in more out-of-the-way places like rural areas of Northern Florida. In fact, as you will see in our top ten, you might be surprised to find some of the best events at the unlikely settings: Say a world famous race track near big-city Miami or along one of the most scenic but often forgotten routes near small town Walton. It's all music to your ears here in Florida. It was "big" enough for encores after its 2014 debut. But a major reason was to combine a music festival with thrill rides and food trucks. Don't rule out another lure: the festival's beer garden. Past performers included Outkast, Cake, Vampire Weekend, Tegan and Sarah, Violent Femmes and Foster the People. The three-day event is held in May. Held each March in Miami, the Ultra Music Festival says of itself that "elite DJs" are on hand for "The world's premier electronic music festival." That may be disk jockey hyperbole but the event draws hundreds of thousands and creates traffic jams in the city during its yearly run. It started out modestly as a one-day event in 1999 but grew within a few years into a three-day festival. The last one featured the reunions of "Rabbit in the Moon" and "Pendulum." Headliners this year who performed on seven stages included Eric Prydz, Purity Ring and Tycho. Following the festival, for the first time, Ultra Music Festival was voted the "World's Best Festival" according to 2016's DJ Mag survey. Tickets sold out two months before the event. Perhaps the best description came from a gratified blogger: "It's like Reggae Woodstock, but on the beach." It was started by his mother, Cedella Marley, and members of the Bob Marley family perform regularly. Expect a lot of Bob Marley tribute songs. The varied food is an event in itself: everything from ordinary hot dogs to unusual Caribbean dishes. The event also features arts and crafts vendors and even tattoo and massage parlors. The charitable gathering each year collets millions of canned goods to donate to homeless shelters in the U.S. and Jamaica. Or EDC, as almost everyone calls it, is an international event but the Orlando version each November has quickly become as popular as the area's theme parks, which have made it the world's No. 1 tourist destination. The best description is "electronic dance music, full-size carnival rides, performers and art." It happens, rain or shine, which might remind some attendees of Woodstock's famous mud-producing rainy weather. Past performers have included Bassnectar, Alison Wonderland, Tiesto, Kaskade, Paul Van Dyk, Andy C, Excision, and Calvin Harris. What makes this unique is that you can view favorite acts from the top of a Ferris wheel. Hey, this is not Walt Disney World. But there are the usual carnival-style or even theme park dishes such as hot dogs and funnel cakes. Because of the music it provides, the best description of it is a carnival with music or maybe "the ultimate circus." This music festival is "smack dab in the middle of Florida…But if you just want to go see some headliners for the day, I advise you to skip the drive." Huh? What kind of endorsement is that, anyway? But another critic says this particular Florida festival has an element "desperately needed." These different evaluations raise three questions: Where is this festival? Who are the performers? And what's the difference desperately needed? Answer to the latter: camping. "There is something special about going back to your campsite and just snuggling up with your friends after dancing all day in an open field," says one participant. Where is it: the small city of Sunshine Grove in rural northeastern Okeechobee County. Who was there for the first event this year? Kendrick Lamar, Mumford & Sons, Miguel, Skrillex, and many others. The first event also featured yoga and meditation classes, massage tent and body painting. First year events are often iffy when it comes to recommendations but this first-timer saw the limit of 30,000 tickets sold within days. Held each year for three days in April at Fort Lauderdale's Beach Park, this event features many of the hottest and most unique artists in country, rock and roots music. This year's headliner entertainer was eight-time entertainer of the year Kenny Chesney. In its five years, the event has become well-known in part because of its sponsor: HUKA Entertainment, which is a leading producer of large-scale music festivals. Some proceeds from ticket sales (which start at $189 for one day) go to marine research and conservation. Names appearing at next year's event have not been revealed but organizers say they will be the equal of previous years which featured Tim McGraw, Eric Church, The Doobie Brothers and Sheryl Crow. It's one of the largest free jazz festivals in the country, held every Memorial Day weekend for the past 30 years. While admission is free, spectators can buy upgrades for one or all three days ($89 to $199). This includes up-front seating, reserved parking, food and beverage specials, dedicated VIP bars, merchandise and more. You can also add one and three-day unlimited beer and wine packages for an additional $39 and $89. The best deal is the free part: riverside jazz. Snarky Puppy, Jon Batiste & Stay Human and Yellowjackets were among performers at this year's event. New this year was the Jazz Marketplace, which mingles local artists and vendors with downtown establishments. Held along the Suwannee River at the Stephen Foster Folk Culture Center in rural White Springs, the Florida Folk Festival started humbly enough 65 years ago. Today, the three-day event features over 300 storytelling performances, jam sessions, folk music workshops, various demonstrations, folkloric dance showcases and the type of food often found only in Florida. At the Florida Folk Festival you can sit with the masters who keep cultural traditions alive. There's a lot more to do than just listen. You can try it yourself playing mandolins, telling stories or making pine needle baskets at various sessions. In addition to food, there's shopping with traditional craftsmen. As the sun sets on the Suwannee, there are concerts by moonlight. The festival has been recognized by the Southeast Tourism Society as a "Top 20 Event" for many years. This is a glimpse at the real Florida: away from the city high-rises and the endless miles of blacktop pavement. This event, which started in 1983, is a contemporary Christian music festival held in September at Walt Disney World in Orlando. This year was the first time it was held at the ESPN Wide World of Sports. Another new offering was "Fields of Joy," where guests tested their sport skills. They played a game of soccer, or tested their pitching speed or made basketball free throws. In addition to music, there were Christian comedians. This year, in addition to those events, there will be a variety of food trucks offering various dining choices. Oversize versions of games like foosball, chess and others are also expected. The event is known for giving attendees the chance to meet participating musicians where photo sessions are also held. A wide spectrum of musical genres takes center stage-from rock and pop to folk and gospel. A second area popular Christian musical event is held at another theme park: Universal Studios, called "Rock the Universe." They have similar musical offerings but only Disney can also offer Mickey and Minnie to greet its guests. This festival, held in January this year, took place in one of the most neglected but scenic Florida highways in South Walton County. Amphitheaters, town halls, restaurants, theaters, bars and covered patios transform into unique music venues for many performers headed by Jackson Browne. He was named to the Rock and Roll Hall of Fame in 2004 for his songwriting. Browne was joined by others that included Grace Potter, Shovels & Rope, Matraca Berg, Suzy Bogguss and Gretchen Peters. The events draw performers who perform their own songs in genres ranging from folk to country, blues, soul and Americana. Attendees have a rare chance to meet with the entertainers. But they should not neglect route 30A either. It runs from long-leaf pine flatwoods along the white sandy beach past oat-covered dunes. Simply the most gorgeous seaside route in Florida, with shops and restaurants along the way to break up the native Florida scenery.